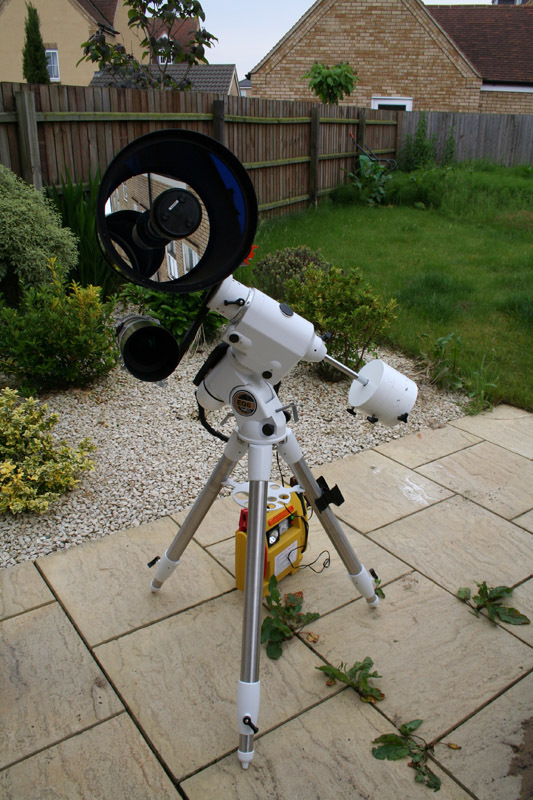 It seems like forever since I was last out in my own garden with my own astrokit (23rd April), but finally the skies cleared and allowed me out to play. This was my first serious session with the “new” EQ6 Pro + C11 + ED80, and so it took a while to get everything organised, attached, cables routed, etc, but I got there eventually. With the nights so short and light, I needed to choose a target that would be bright and easy to image. Yes, sadly its M13… another one! I do have a soft spot for M13, it was my very first DSO I ever imaged back in May 2007. Things have changed a LOT for me since then, new kit, lots of experience, a lot of confidence… but all this counted for nothing with a completely new rig to get working last night. Thankfully, I used EQMOD + GPS + wireless gamepad, which made life so much easier. I only touched the Synscan handset when i powered up and when i packed it away. Anyway, here are the results of my first imaging light with the C11. I learned a lot of things last night, useful things that will help me set up faster and get imaging sooner. Am already looking for the next clear night! My NexStar 8 GPS continues to serve me well (when the UK skies actually co-operate), and with the Hyperstar attached, it supplies me with plenty of quality image to data to work on. What I do miss is actually looking through my telescope… yes, odd really! 🙂 I would love to look through my telescope more often, but gievn that clear skies here in the UK are in terribly short supply, if its a choice between imaging or observing, then imaging always wins. I`ve been on the lookout for a suitable observing system for a while. I did toy with the idea of getting a Celestron 6SE, but I wanted something with more light grasp. 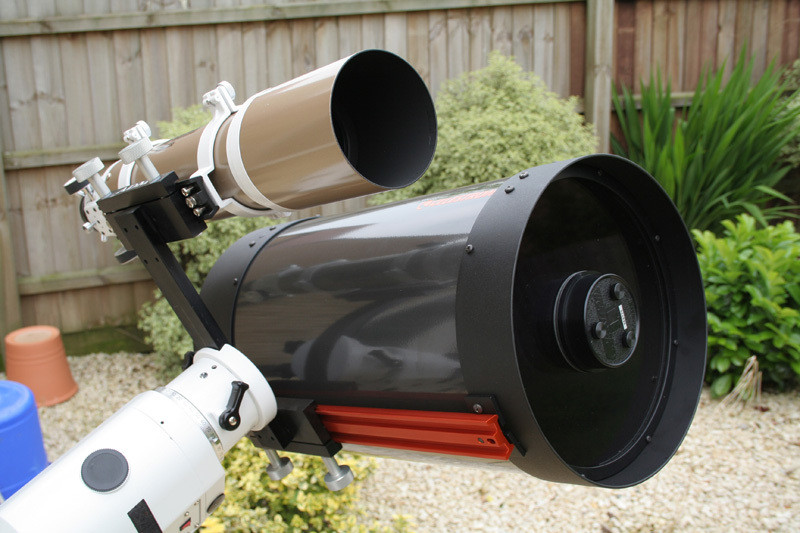 I also toyed with the idea of a SkyWatcher FlexTube 12″ Dobsonian (which I was fortunate to use at Kelling star party in Spring 2008), but there is something to be said for the old saying “Being in the right place at the right time”. With my annual bonus arriving recently, I was offered two great (and complimenatry) deals by two friends at the same time, so I jumped at the chance to expand my equipment list, and it can be used for observing and imaging, depending on the seeing and sky quality. It will take me a while to get used to this new system, as I have never used a GEM before. A bit of a learning curve ahead for me, learning to use the polar scope, having to do the real polar alignment the hard way (unlike the oh so easy Celestron Wedge Align routine! ), plus the joys of EQASCOM look tempting but overwhelming. More news as it happens… thats if I ever get to see clear dark skies again!